Bite into anything in this richly forested taluk of Karnataka and be sure it would be organic. Chemical cultivation practices have not been introduced in Sirsi. What’s more, all the healthy traditional food practices of Malnad, disappearing fast elsewhere, are retained here in near-exact form. Cooking means using fresh green chillies or pepper instead of packaged red chilli powder. Sugar is not available because people still consume the healthier and better tasting liquid molasses, sold in jars just like honey. Sirsi, for sure, is a health foodie’s dream. A unique medicinal drink of this region is thambli. It is made from a wide variety of herbs that grow in wild abundance and buttermilk made from fresh and sweet curd. The mildly flavoured drink can both cure and prevent diseases. It contains paste of a single herb or a combination of herbs, often marking the beginning of a meal. It can also be consumed at the end of a meal with rice. Some drink it as a routine health practice, while others to treat health problems like jaundice, malaria, post-natal weakness. Prepared with specific herbs it has to be taken on an empty stomach, morning and evening. “During my grandmother’s time thambli was prepared with a hundred different herbs,” says Shankar Hegde of village Mallenhalli. “We remember just a few.” Hegde showed Down To Earth how the drink is prepared. Its ingredients range from common kitchen herbs like curry leaves, mint, coriander, vegetables like fenugreek (Trigonella foenum-graecum) to tonic herbs like brahmi (Centella Asiatica), shatavari (Asparagus racemosus) and sova (Anethum graveolens). Herbs typically used in ayurveda like bhui amalaki (Phyllanthus niruri) and bhui neem (Andographis paniculata) are also used. While consumption of medicinal herbs in one form or the other is common in almost all parts of rural India, what makes thambli unique is the pleasant experience it gives while taking in bitter herbs. Curry leaves are never ingested when added to dishes. But as paste in thambli, they are. “Take the case of the bitter bhui amalaki leaves which are used to treat liver disorders,” says Hegde. “It is impossible to eat them raw. If boiled, their nutritive and medicinal values get reduced. The decoction is not pleasant to drink either.” But when added to thambli the bitterness in bhui amalaki gets reduced and it becomes a soothing experience, he says. Thambli’s sweet flavour calms the body system and helps in absorption of the ingested herb. Wash the leaves and grind to a very fine paste with the cumin seeds. Add a generous spoonful to the glass of buttermilk. Add salt and molasses or jaggery. Stir till everything blends evenly. Serve cool (not chilled) as a drink or with rice. You can add a dash of black pepper powder, but avoid chillies. 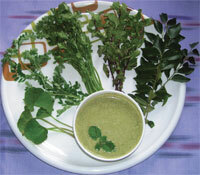 Note: The same method and ingredients apply for thambli prepared with other herbs.